Back in January 2015, the first Life is Strange series debuted. Its five episode run came out over the course of ten months. The longest waits came between episode four and five with a three month gap. Life is Strange: Before the Storm’s three episodes released over four months, averaging a two month wait between episodes. Following this trend, you would think that the next game would be keeping wait times down, but that would be wrong. According to the Life is Strange 2 roadmap, released earlier today by developer Dontnod, fans are in for some significant gaps. The first episode of Life is Strange 2 was released in September 2018. Four months later, in January 2019, Dontnod released episode two. As the roadmap above shows, fans will have to wait another month and a half for episode three, in addition to the three months we have already waited. After that release date of May 9th, there is another three and a half month gap until August 22nd, when we can get our hands on episode four. 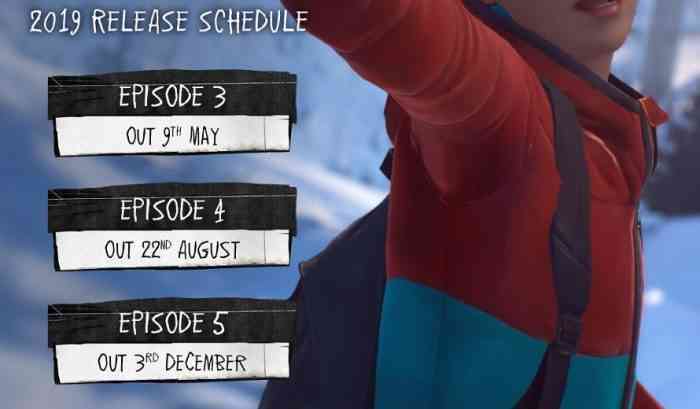 The final episode will conclude Life is Strange 2 on December 3rd, another three and a half month later. Question Time: [Jerry Seinfeld voice] what’s the deal with all these gaps? Seriously. I know Square Enix likes to make fans wait for new games, but this is a little ridiculous. Is this a decision based on poor planning? Releasing these episodes as they are developed? Or does Square Enix think these are reasonable gaps between two hour play sessions? Games like Rainbow Six: Siege come out with new content every couple of months to keep fans engaged. Is that not a timeline episodic games should aim for? Is three to four months a reasonable wait time for Life is Strange 2? Let us know in the comments below.